A few of months ago, we featured a series of maps depicting fictional battles between the prominent mascots of KFC and McDonalds: Colonel Sanders and Ronald McDonald. 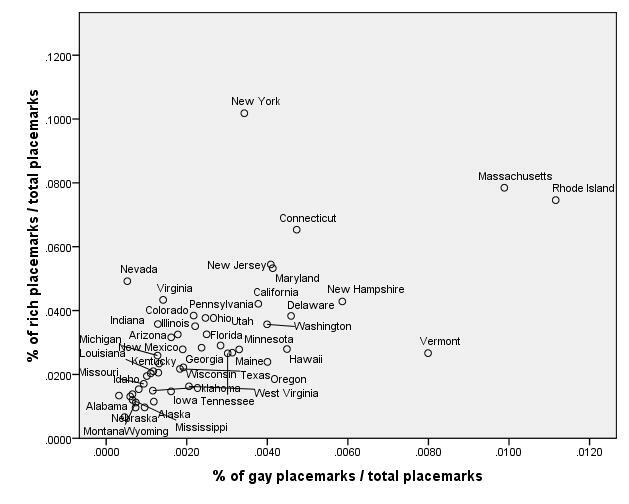 Besides the fact that someone (ahem, Mark) forgot that we had already posted these maps, we thought that it was worth connecting our analysis to some recent discoveries, especially through a Lucasian theoretical framework. Some historical background is provided in the video below for any readers unfamiliar with this theoretical formulation. Our original series of maps (see one replicated below) shows distinct geographic patterns of influence for the two fast-food chains. 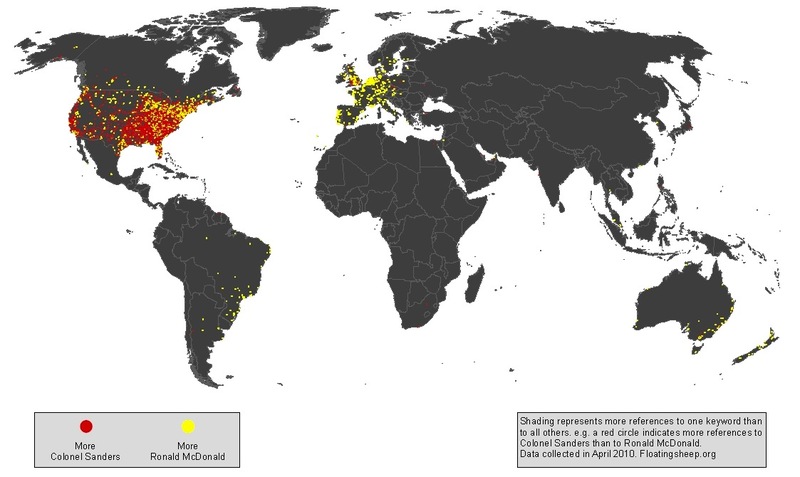 McDonalds is dominant in much of the world, being especially visible in Europe (particularly in the Netherlands for some reason). The Colonel, on the other hand, has a strong redoubt in the south and west of the United States. However, this area is not nearly as homogeneous of a fast-food landscape as the Ronald McDonald's stronghold in Europe. Of course, given the concentration of McDonalds in Amsterdam and Europe, we can't but help to wonder of we need to make Quentin Tarantino a honorary member of the Floatingsheep collective. A fascinating website called The Full Wiki has recently been brought to our attention. 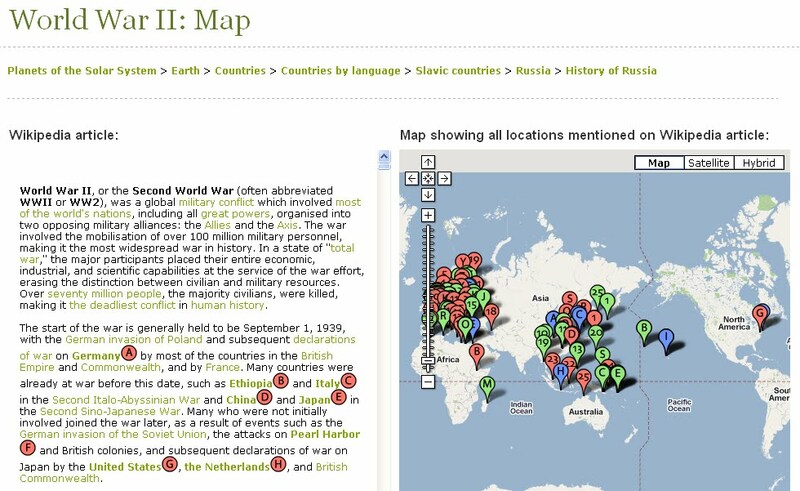 The site contains an excellent mapping tool that allows users to visualise the locations of all places and events mentioned in any wikipedia article. The entry for World War II for example, brings up a detailed map. Clicking on any point will bring up the snippet of text in the Wikipedia article that mentions that specific place. Needless to say, this is a useful tool for uncovering the not only the places mentioned in any article, but also the silences and omissions. We should point out a curious anomaly for the map of the article on monkeys. The only location shown is in downtown Washington DC. We won't ask why. Since Sarah Palin was recently talking about our blog on cable news shows, we decided it was only fair to map out her so-called tea-party movement. 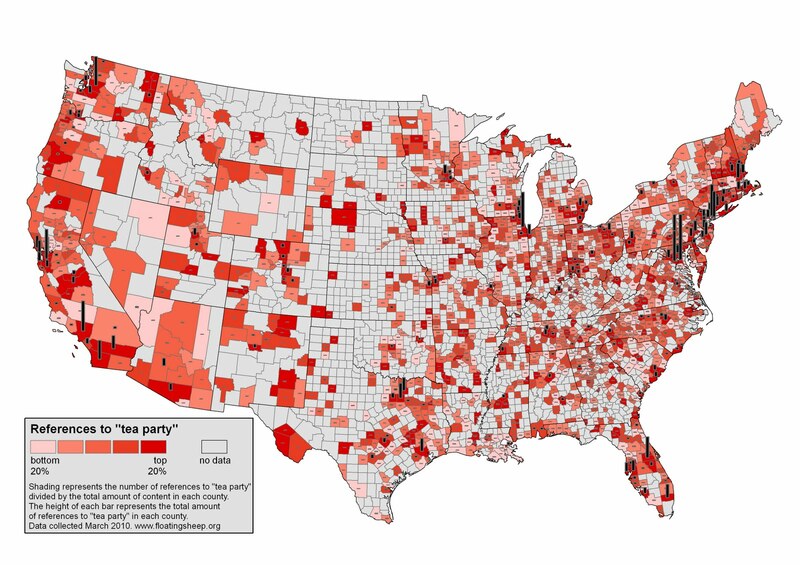 It is interesting that the West Coast and the northeast of the country have some of the highest relative and total hits for the tea party. Perhaps this refudiates the claim that these are less pro-America parts of the nation. Or, depending upon your point of view, it may confirm that the coasts are out to destroy the country. Also the patterns we see in the above slice of cyberscape, represented by data drawn from Google Maps, is matched by another slice of cyberscape drawn from Twitter. 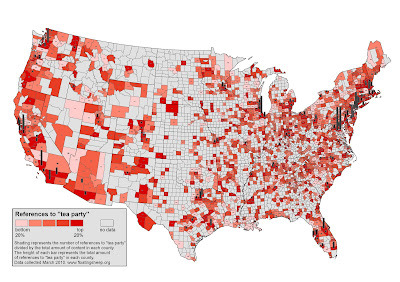 A presentation by Pete Skomoroch, Kevin Weil, and Sean Gorman shows the distribution of tweets with the term tea party. It shows Lady Gaga, as well, if you're curious (check out slide 68). We should also point out that just because you can't see Russia on these maps is no reason to misunderestimate them. There's also a distinct possibility that we're missing out on a whole slew of geotagged data due to the misspelling of fairly simple words. Those of you in (or near) Lexington, KY should check out the Open 2.0 Conference happening at the University of Kentucky. Lots of interesting speakers but in the spirit of shameless promotion, Matt will be giving a talk on the 19th at 9:00 am on "Open Geographies". Building on our visualisation of 34 million geotagged Flickr images, we have decided to map the data normalised by population and area. In doing so, some quite interesting patterns are evident. Predictably, we see some of the same core-periphery patterns that are observable in other types of user-generated content (e.g. Wikipedia). More surprising is the fact that unlike the geography of Wikipedia content, there are a significant number of low-income countries with relative large amounts of content (i.e. images) per every 100,000 people and 100km. Cambodia, Oman, Namibia, South Africa, Nepal and a host of other countries all score highly using these normalised measures. I would hypothesise that two factors are at play here. 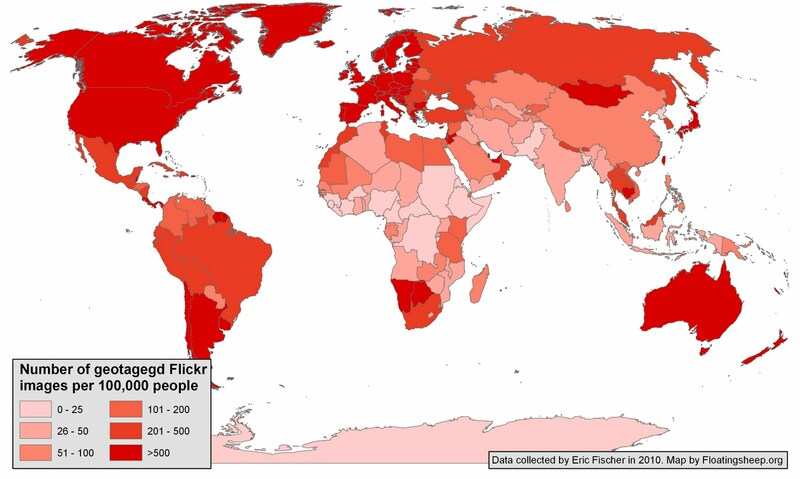 First, there are lower barriers to entry on Flickr versus Wikipedia. In other words, despite the openness of Wikipedia, it is still easier to upload geotagged photos to Flickr than to create a new article and defend it's existence against nominations for deletion and overzealous editors. Moreover, the binary developed vs. developing country division has always masked the range of differences between and within countries, e.g., an interesting comparison between Oman and Yemen. Second, it is also probable that much of the content in low-income countries is created by visitors and tourists. For instance, a significant number of photos geotagged to Cambodia are likely tourist shots of the Angkor Wat temple complex rather than locally created scenes of more everyday events. Whatever the reasons are, more research is clearly needed on the topic to uncover what the specific biases in authorship are. Furthermore, irrespective of the specific reasons, it remains that these maps continue to show significant unevenness in user-generated content around the world. Graham, M. 2010. Neogeography and the Palimpsests of Place. 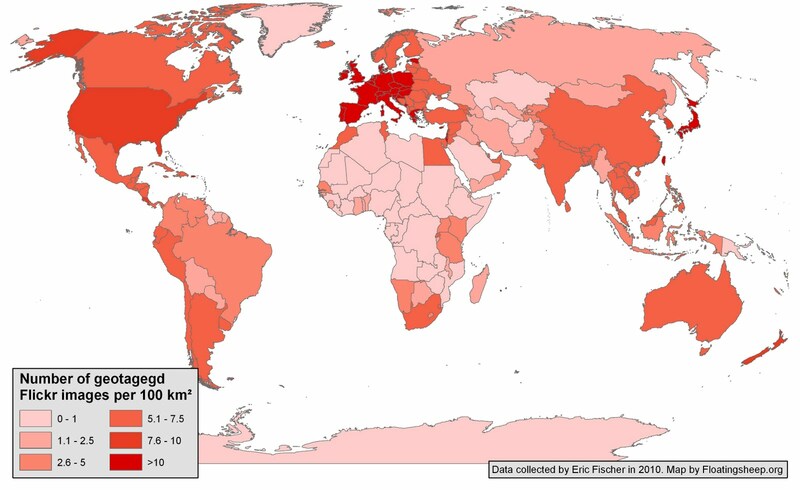 Tijdschrift voor Economische en Sociale Geografie 101(4): 422-436. 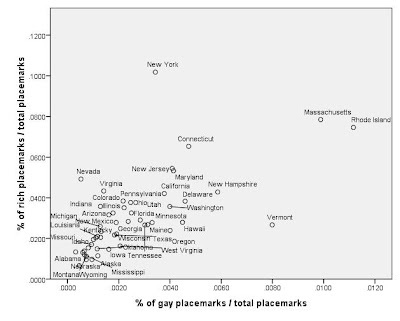 Our series of posts on statistical correlations have shown that references to "Christianity" within cyberscapes are highly correlated with obesity, while places with many references to "feminist" and "gay" have the opposite relation. Despite the appeal of some of these correlations, per capita income likely remains the most important, albeit not the only, underlying factor in shaping these relationships. Given the important causal role of income to obesity we were curious whether this might extend into the virtual world as well. In other words, can we correlate references to income within cyberscape with references to other cultural markers such as "gay" or "feminist". Earlier maps we made of references to "rich" and "poor" within the Google Maps database revealed concentrations of rich in expected places, e.g., the coastal regions of the U.S. 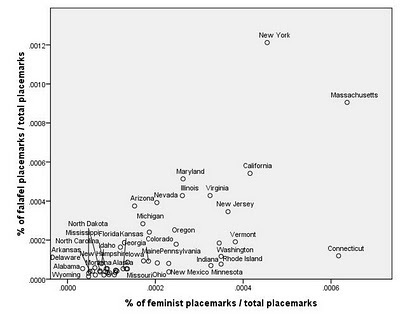 Thus, we wondered how the number of references to "rich" would correlate to references to "feminist" or "gay". 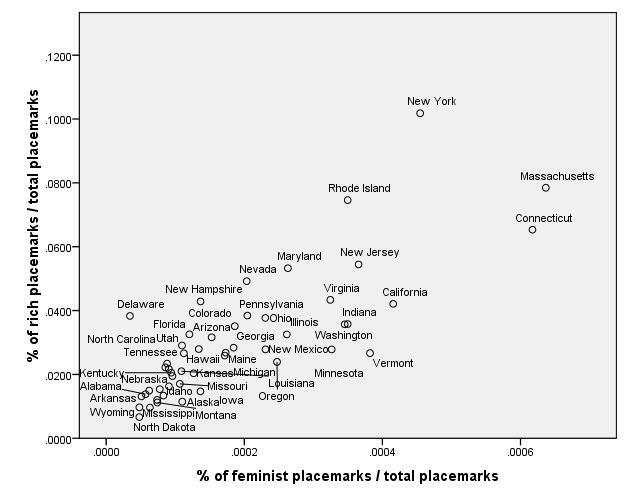 Gratifyingly, there is a strong positive correlation between references to the keywords "feminist" and "rich" (0.795) and "gay" and "rich" (0.66). This is consistent with our idea that the virtual representations reflect(albeit not perfectly) many material practices, events and places. This is an idea that we explore in more detail in many of our more academicly geared papers and publications. But we'd be doing a disservice to the loyal followers of Floatingsheep if we didn't extend our line of questioning to the next improbable, and highly spurious, level. Given that we started our series of correlation experiments by discovering the negative relationship between obesity and virtual references to "feminist" and "gay", we must now ask what foods are associated with these terms within the cyberscape? A burning question to be sure. 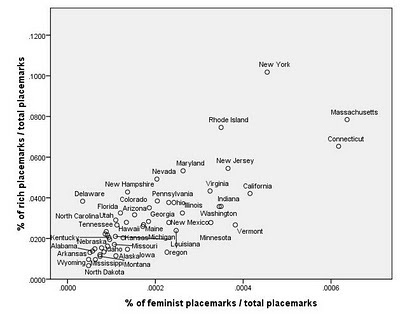 As the graphs below illustrate, references to "feminist" and "falafel" are highly correlated (0.658), as are references to "gay" and "shepherd's pie" (0.629). Not exactly, the correlation that we expected, but data does not lie . Perhaps the route to weight loss is falafel and shepherd's pie? We're not entirely sure how to interpret this, but it is (ahem) food for thought . Data does however roll over and allow itself to be manipulated shamelessly. It really is a bit of a milquetoast. Sometimes we wish data would have a bit more of a backbone. Actually, we're fairly sure that the underlying cause of these relationships is once again income. At least in the case of falafel, i.e., falafel in the U.S. =~ more cosmopolitan =~ higher income. 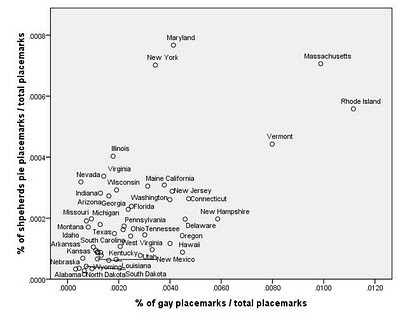 But we're intrigued by the significantly higher levels of shepherd's pie in New England (New York, Massachusetts, Vermont and Rhode Island) and the outlier of Maryland. Yum?